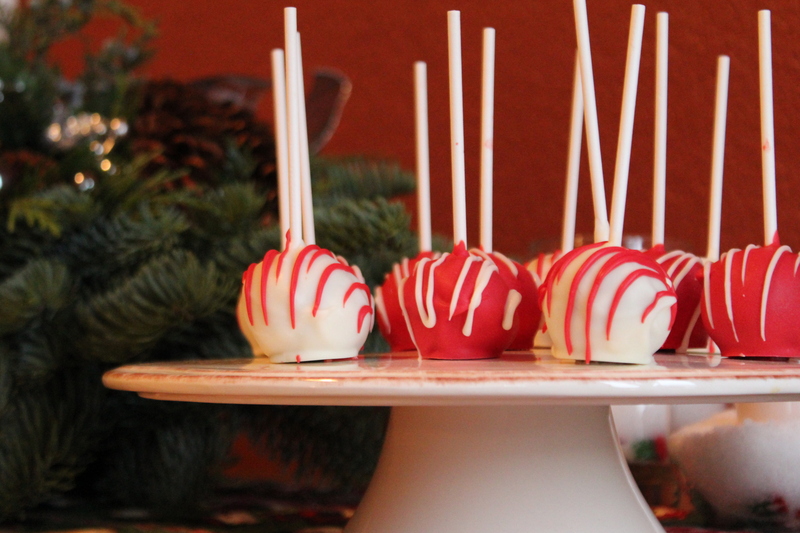 Cake balls have become one of my favorite desserts to make. I don’t make them all fancy and wonderful like Bakerella does, (she’s amazing! ); mine are just plain and simple. And I’ve learned a lot in the two years that I’ve been making them. In this post I’ll tell you some tips I’ve learned along the way through trial and error. This post isn’t a tutorial, but if you’d like one, check out these posts here and here I made over a year ago and this past July, respectively. Just please be kind to me and naivety. As I said, I’ve learned A LOT. 1. To melt candy melts, or chocolate, (which I’ve done before too), do not use a double boiler to melt the cancy coating. Or, if you do, make sure it’s still not on the burner and the stove top isn’t on. You’ll melt the cake balls, which will make it very difficult to coat, since most of it will end up being clumps in the candy melts. 3. Watch the microwave. I can’t tell you how many times I’ve burned the candy melts! 4. Shortening is your best friend when the melts are too thick. Put in 1 tablespoon at a time and fully mix it in to thin it out. The candy melts should be the consistency of heavy cream. 5. Take your time. This can be said for everything, but it’s important to not be rushed or distracted. 6. Let the cake balls get really cold. I usually make the balls in the morning and coat them later in the day. If they’re not cold enough then they will fall apart when you melt them. And then there are small cake clumps in your melts. No bueno. 7. 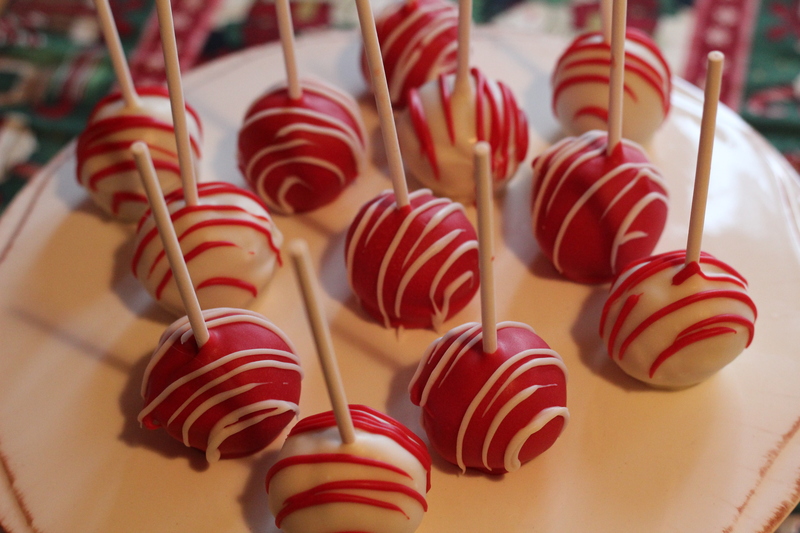 Place finished cake balls in fridge when done, especially if you have a cream cheese frosting. 8. If, after you coat the balls, they crack, recoat. It just means you rolled them too tight. 9. Work in small batches. I pull out 5-6 balls at a time to work with. This allows the balls to stay cold in the fridge and not get to room temperature while you work with the other balls. If they’re too warm, they won’t stay on the stick and/or crumble in the melts. 10. Have all the supplies ready. It’ll ease frustration and make for a smoother, more enjoyable ride. Bake cake according to box directions in a 9-by-13-inch pan. Let the cake cool completely. Once it is cooled, place the cake into a large bowl and crumble it using a straight spatula. Start by adding about ½ of the jar of frosting to the crumbled up cake. Only add a little bit at a time, mixing the frosting in. You want to make sure there are no traces of frosting. To achieve the correct consistency, the balls will hold together when gently squeezed in your hand. To melt the candy melts, follow the instructions on the package. If the melts are too thick, use 1 tablespoon at a time of shortening to thin it out. It should be the consistency of heavy cream. (Mix the shortening into the candy melt until the shortening has melted.) Use one color at a time. 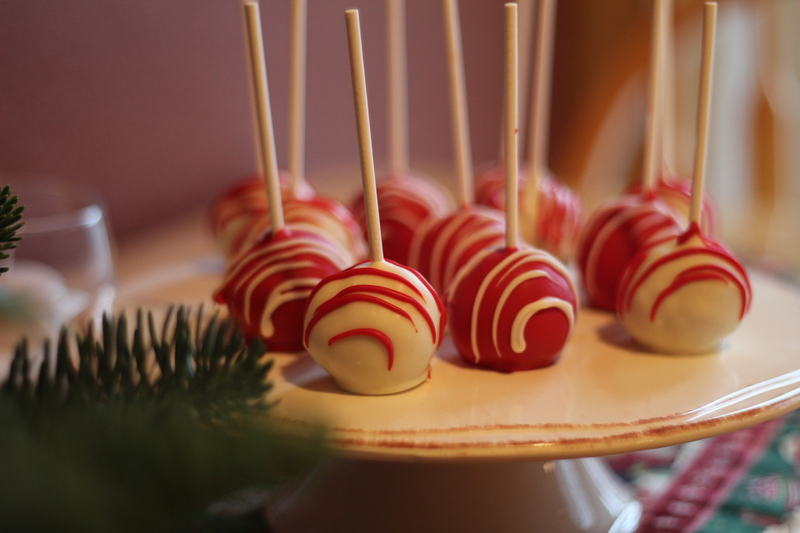 Working with a few cake balls at a time, dip the lollipop stick into the candy melts about 1” down and then dip in the cake ball. (This makes it easier to coat the ball near the stick. I also leave all the cake balls in the fridge and pull out 5-6 balls at a time to work with. This allows the balls to stay cold in the fridge.) Then dip the ball into the candy melt to completely cover it. Tap the stick on the side of the bowl to let any excess candy melt drip off. Place onto wax paper to dry completely. Do this for all the balls. Melt the other contrasting color and pour into a squeeze bottle. Working with one ball at a time, gently squeeze the bottle as you use a back-and-forth motion over the ball to create the “stripes.” Let dry. Serve immediately, or store in the fridge until ready to eat. I loved this! 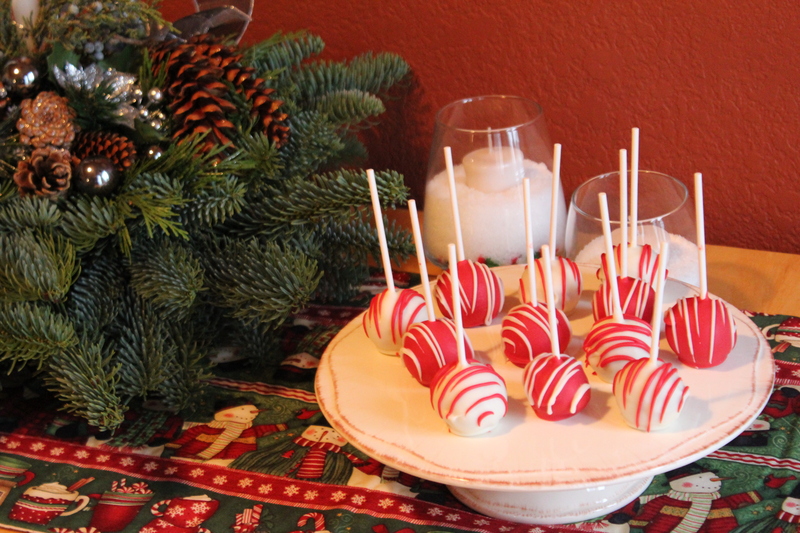 Another easy tip (especially for those who are short on money or time – and don’t have time to get those special cake pop sticks) is to use a toothpick to dip the cake balls in the candy coating! When the coating dries, gently pull the toothpick out and dip the toothpick in a little bit of the coating to cover up the hole. It’s really simple! I’m going to try my hand at these for Christmas. I’m going to try several flavors, too! Question: Do you have to use the sticks? Can you use a fork or toothpick or something to coat them (like you would pretzels) and skip the stick? Or, is it just so much easier to go with the stick. Yours turned out so pretty! Thanks! That would totally work, and I have done that before. Just scoop up the ball with your fork or spoon and tap the side of the bowl to get any excess coating off before placing on the wax paper. I wouldn’t use a toothpick, unless you want to leave it in the cake ball; otherwise, you’ll have to try to cover the hole and your coating won’t be smooth. Good luck! Thanks for the tips, Holly. I’ve never made cake balls before, but I’m feeling a bit more confident now. These look like the perfect thing to bring to my girlfriends’ Christmas cookie exchange! Any suggestions on flavors? I love lemon cake with lemon frosting, but the Funfetti cake mix with vanilla frosting is good too. Red velvet with cream cheese frosting is also good and popular around Christmas time. For candy melts, the vanilla flavoring is good for any option, and any color you like would do. Good luck and let me know how they turn out! I just started making cake pops, one thing I’ve learned dip your stick in the melted chocolate, let cool then stick the stick in the cake ball, keeps it on there better! Your pops look great and festive!! I am enjoying my lemon truffles..kinda like a cake ball! :) Thanks for all the encouragement and cake ball hints. I’m happy to know that I knew all but one. :) I have a tip for you that I just learned. Winco sells the white and choc. large melting chips in the bulk section. I used the white choc. just yesterday for the truffles and it melts really runny. I loved it. Wilton’s choc. is always so thick and even when I add Crisco it never seems to make it much thinner. Back in the day when I lived in Bakersfield, CA we had a cake/candy shop where I could buy crystals that you add to the choc. to help it get thinner. Can you buy that here? I just made these a couple days ago…same exact colors! I still have a few left too, which is always nice.